Aboriginal paintings of the fish from all regions of Australia, the most common species & the means of catching them with traps, nets & spears. Aboriginal paintings depicting fish are found from all regions of Australia and reflect the most commonly found species of fish from those locations. Fish are an important part of the food resources of Indigenous people and the means of catching them is also seen in the art. Fish traps were made from vines and fibre and placed across creeks and rivers. More permanent fish traps were made from stone embankments, which forced the fish into ever smaller ponds or narrow channels. Indigenous people in the north also used dugout canoes move through swamps and in the ocean to spear fish by hand from the canoe. People in Arnhemland distinguish between the freshwater locations for food and the saltwater locations. Fish of all sorts were hunted – bream, cod, catfish, dhufish, barramundi, eels. Aboriginal people relied on their knowledge of waters and the life cycle of the fish to make successful hunts. Paintings depict the different types of fish and the method of hunting for them, including the making of nets and fish traps. 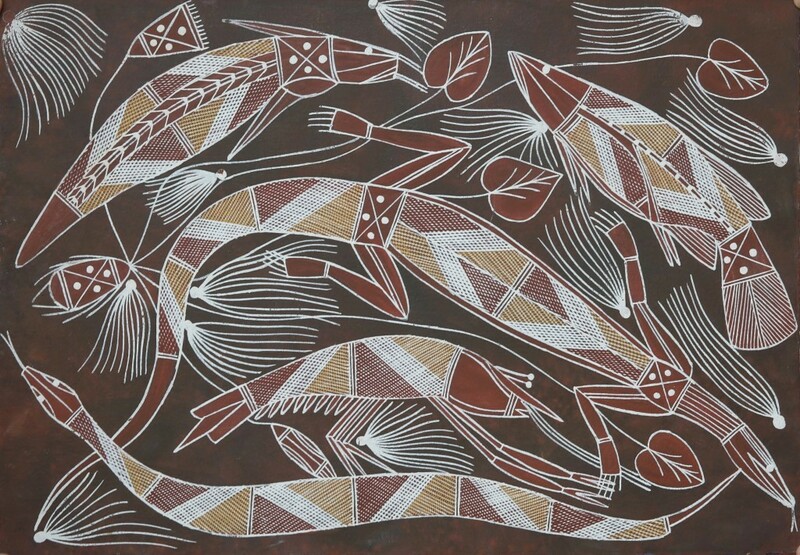 Fish paintings show the close bond between Aboriginal life and the food sources around them. The artists use their everyday experiences to make pictures of how life is lived in their communities.